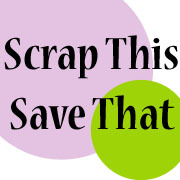 Scrap This, Save That: Hiding In My Craft Room Again! Here's my entry for another Hiding In My Craft Room challenge. More Holiday Catch Up!! This layout is done with Christmas pics from 2008...I'm only four years behind on this one...woohoo!! My hubby and kids were being weenies, as usual! That's Christmas morning in the E. household!! Very cute, but where are the details for it?!?!? where did those cute little cuts come from? ?